Return to the Projects page. 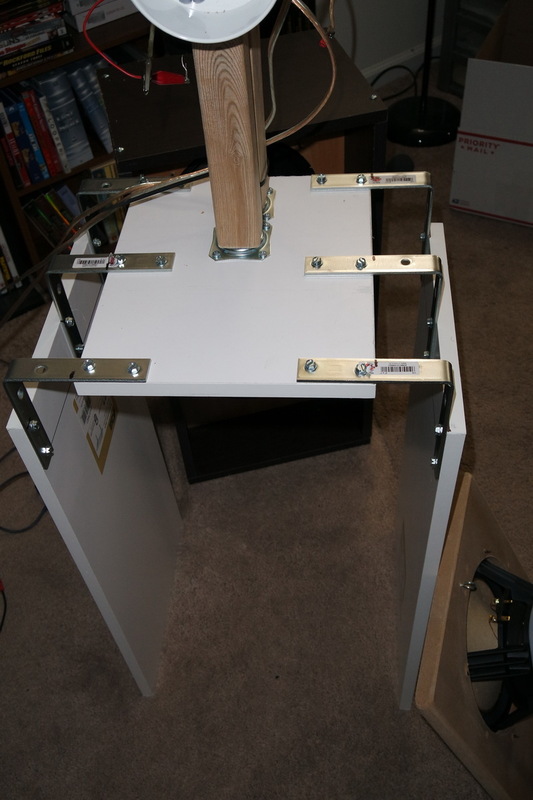 I'm also no longer using the miniDSP 2x4. 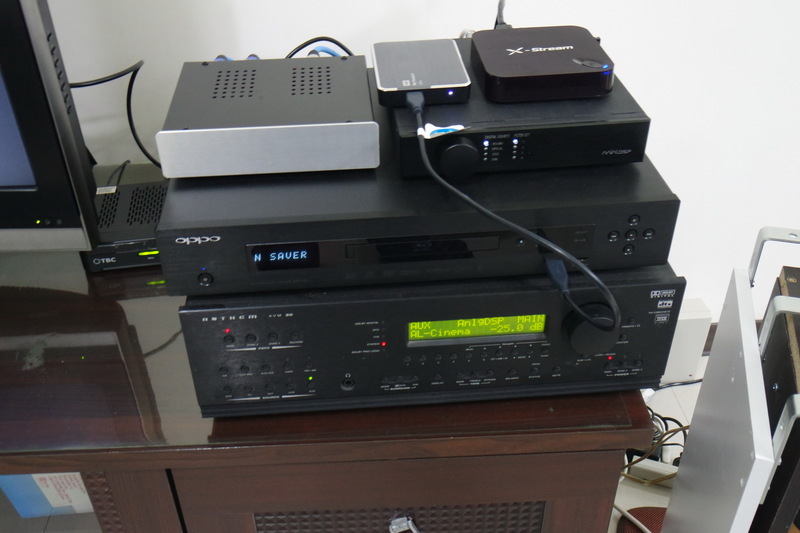 Now I'm using the nanoDigi 2x8 with external DA24QS DAC's I'm using the AD24QS ADC. 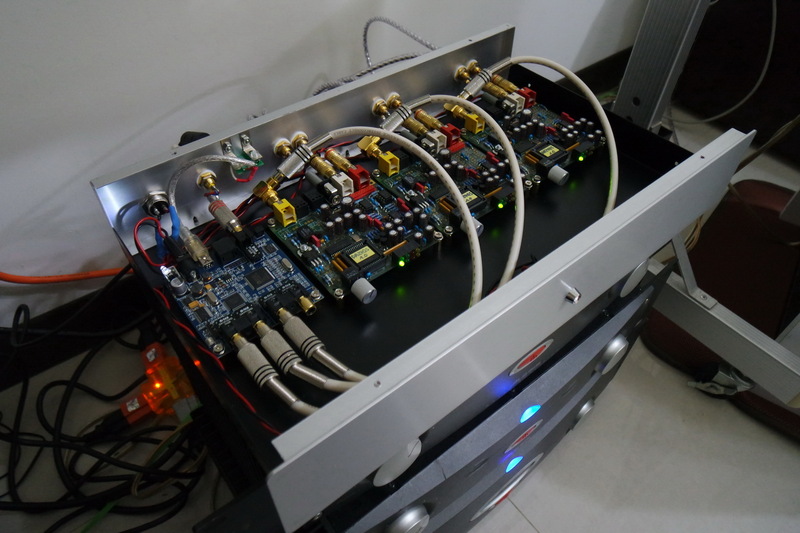 I have the nanoDigi 2x8 and DAC's built into a nice chassis I picked up here in Taiwan sitting on top of the Alesis amplifier stack. 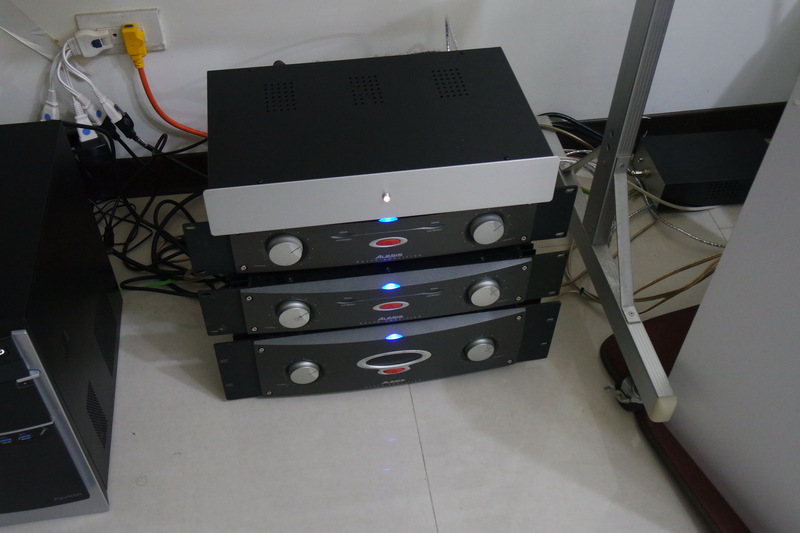 The ADC is built into its own chassis on top of the Anthem Pre/Pro preamp. As good as it already is I do believe it can be improved. 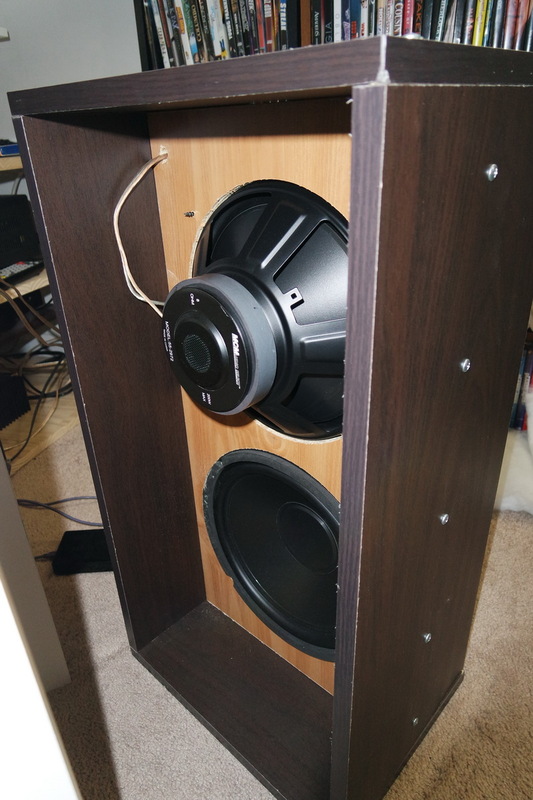 I really don't like pushing the 8" Tang Band to 80 Hz but I also would not like pushing the 10" MCM drivers much higher in the H-frame baffle. A better system would use two 12" drivers in a shallow baffle, probably just a panel with no sides. These would cover from about 80 Hz to perhaps 200 ~ 300 Hz and the low end would be handled by a separate open baffle woofer system. 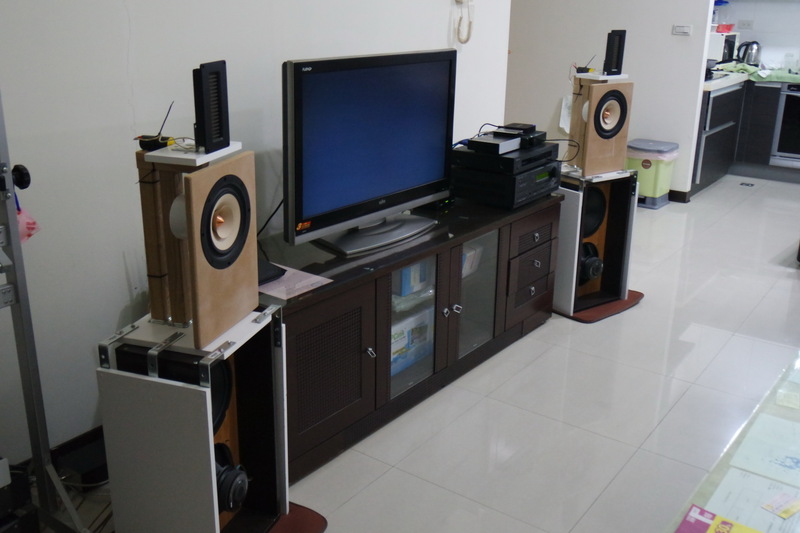 Here in the Taiwan apartment I don't really have an option like this nor do I back home in my existing house. One of the things I'm considering for when I move back to Texas is to build a dedicated 2-ch listening room out back behind the house. 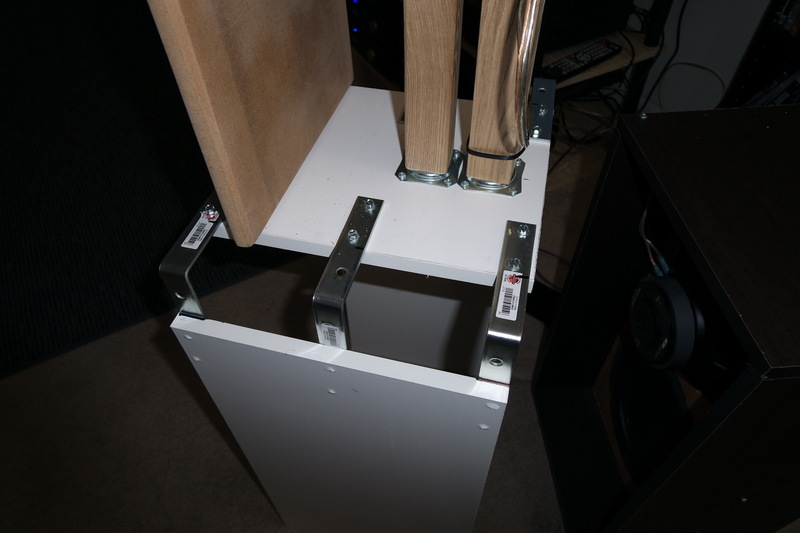 This will enable me to put a floor to ceiling H-frame along each side wall with multiple 15" drivers. I will also have the tools there to build a more cosmetic version of the system. 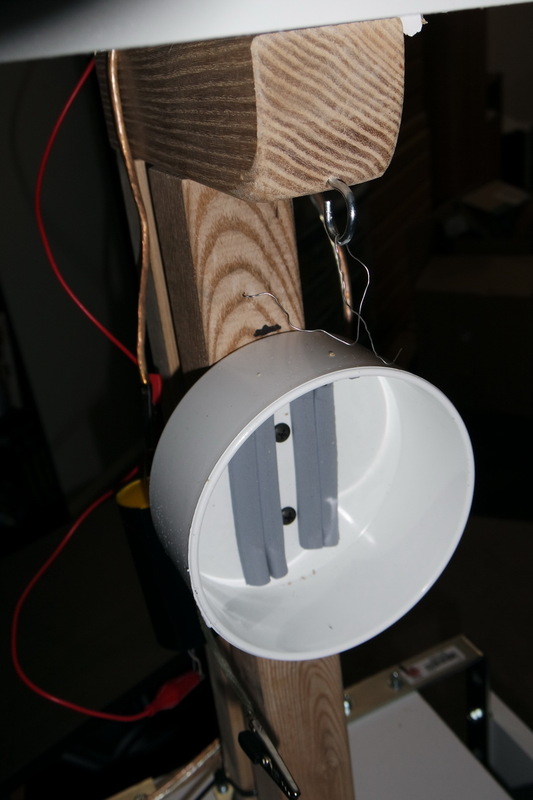 The Dayton AMT Pro-4 motion transformers are now installed on the system. 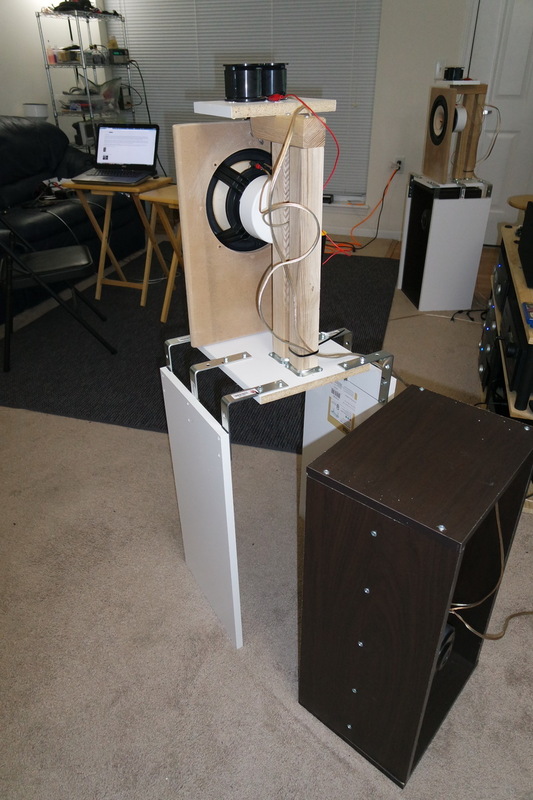 I have updated the crossover now cutting off the Lineaum at 2400 Hz and also cutting off the Tang Band at 80 Hz. I'm also testing the Dayton AMTPRO-4 Motion Transformer. 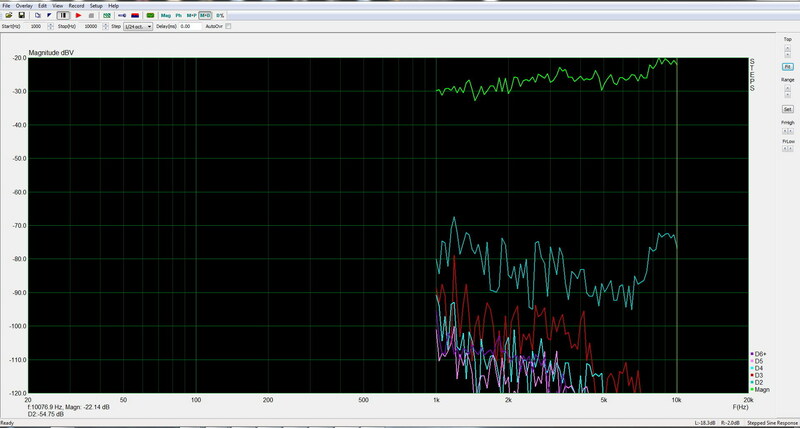 It's at least as good if not better than the Heil and on average about -10 dB lower distortion than the Lineaum. I doubt it has the perfect dipolar dispersion pattern of the Lineaum although I could be wrong about this. It's quite a bit more sensitive than the Lineaum but then it's also about three times taller so it might not be able to beat a stack of Lineaums. I think I might mount the Dayton's on the speaker and dial in a crossover for them and use them for a week or so to see how they compare to the Lineaum. 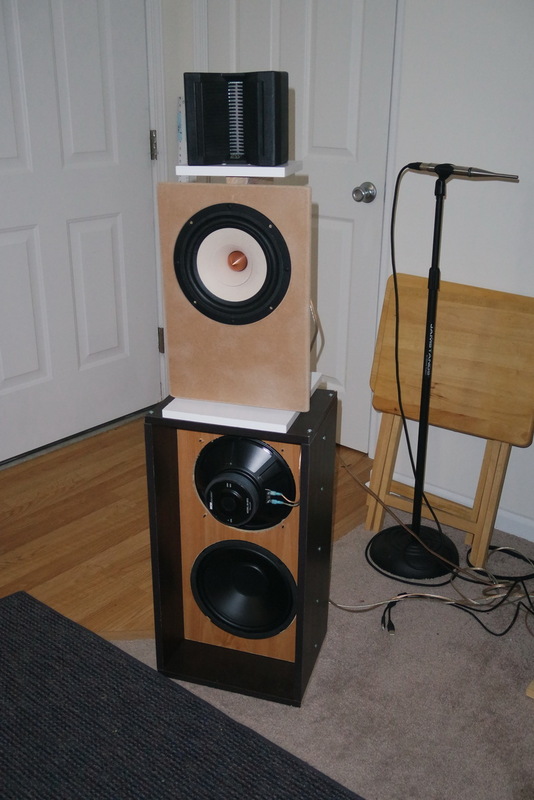 I suspect this speaker will work very well with either the Dayton AMTPRO-4 or the Lineaum. According to Brian Elliot the Lineaum is a near perfect dipole with the radiation pattern being almost completely independent of frequency. I have a theory that this constant directivity may be related to the nature of the design. First, the center is where the maximum excursion occurs with the ends being anchored and second, the radiating surface curves toward the back. In other words, it's a bit like a mini CBT. The center is radiating the most while it inherently attenuates toward the ends and the ends are curved back similar to a circular arc CBT. The front and rear are identical so it makes a near perfect symmetrical dipole radiation pattern. 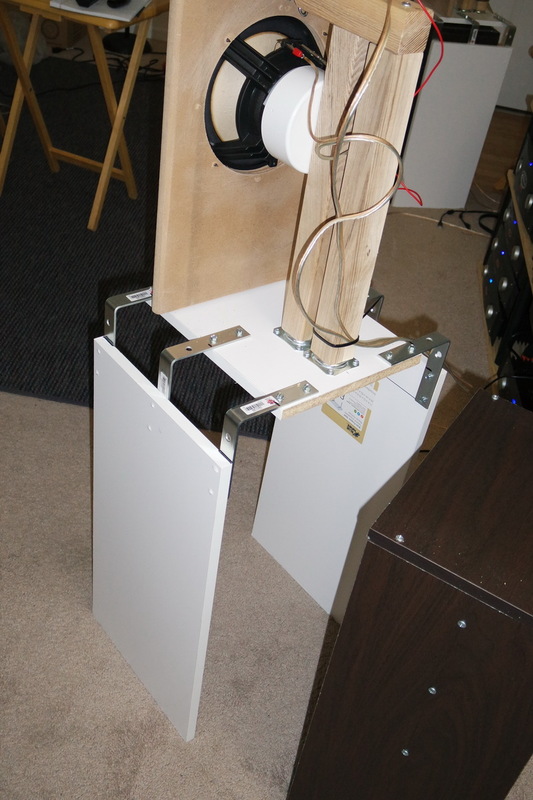 Other than its higher crossover requirement I believe it is a superior tweeter to the ESS motion transformer. Additionally it weighs only a few ounces and will not likely break in half if dropped. 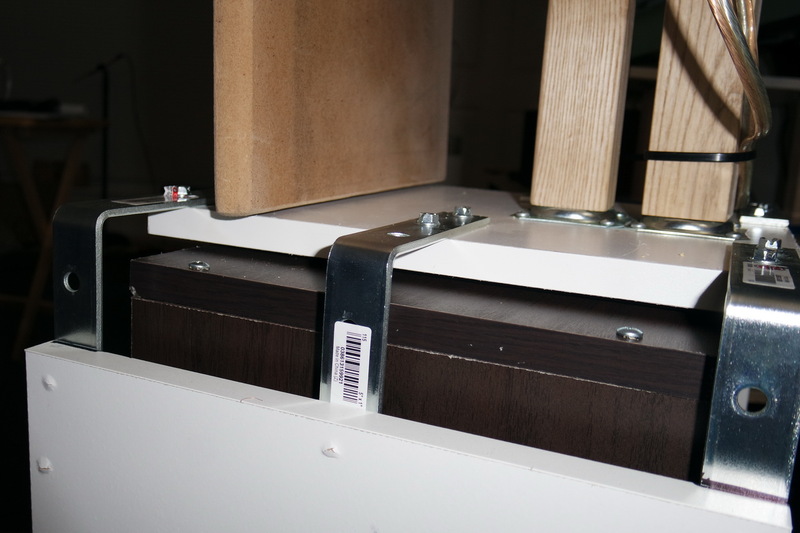 The ESS is made with heavy bar magnets mounted to angle iron pieces each side held together by only relatively thin plastic. While it looks really nice, it's really not that well made. I have to say I'm no longer impressed with these. After the one was broken I had ordered four more from Parts Express but since they no longer carry them that order could not be filled and I have decided not to reorder from another supplier. 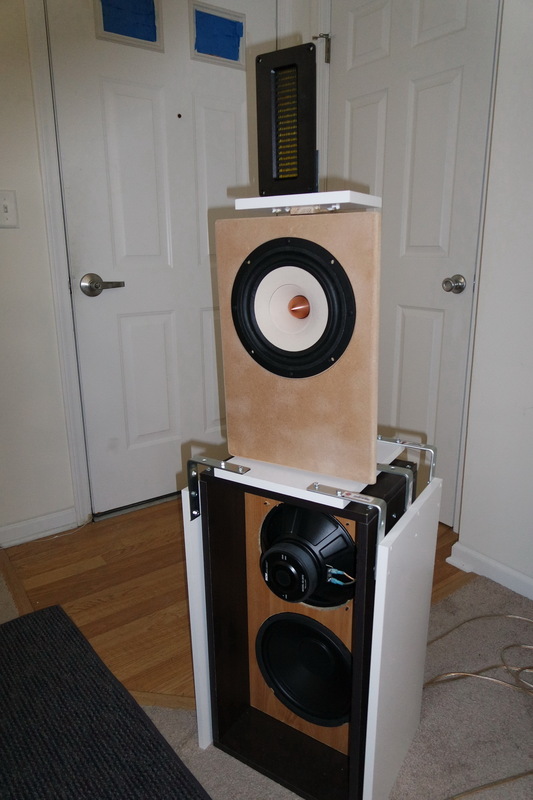 As for the Lineaum I'm hoping Dayton Audio will be building these soon. Currently the only source is to buy used on ebay. If Dayton can build them, they can also improve them by using lighter ribbon material for greater efficiency and possibly build a larger version for lower crossover frequencies. 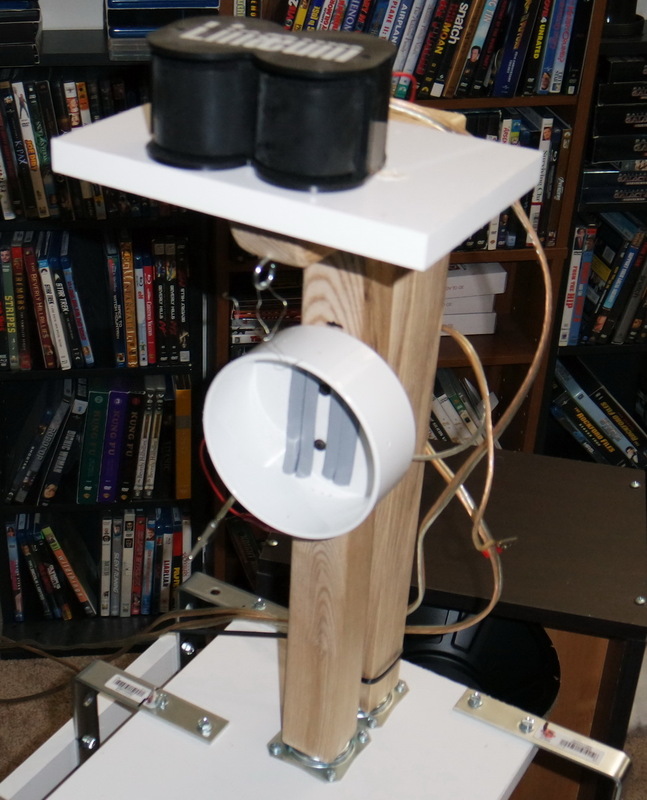 The system: Well, let's call it a prototype! Yeah it looks a little ragged I know. The idea is to isolate everything. 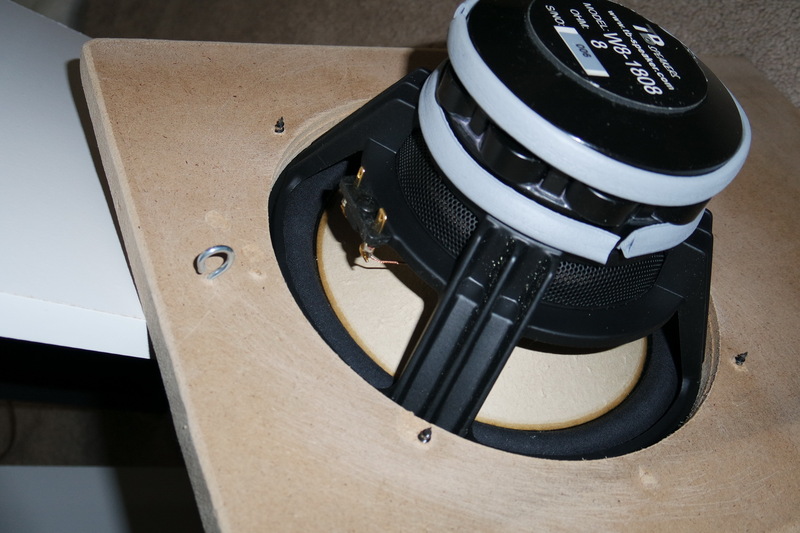 As you can see, the frame supporting the upper part of the speaker straddles the H-frame woofer section thus isolating it from mechanical energy in the woofers. Also, the full range driver is soft mounted by the magnet simply by seating it into the PVC end cap with rubber weather stripping. 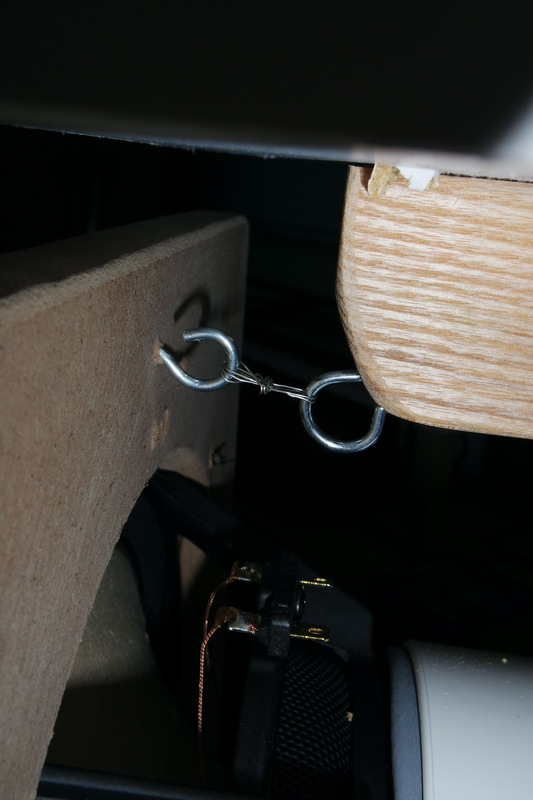 A small wire attaches to two hooks to prevent it from falling out. 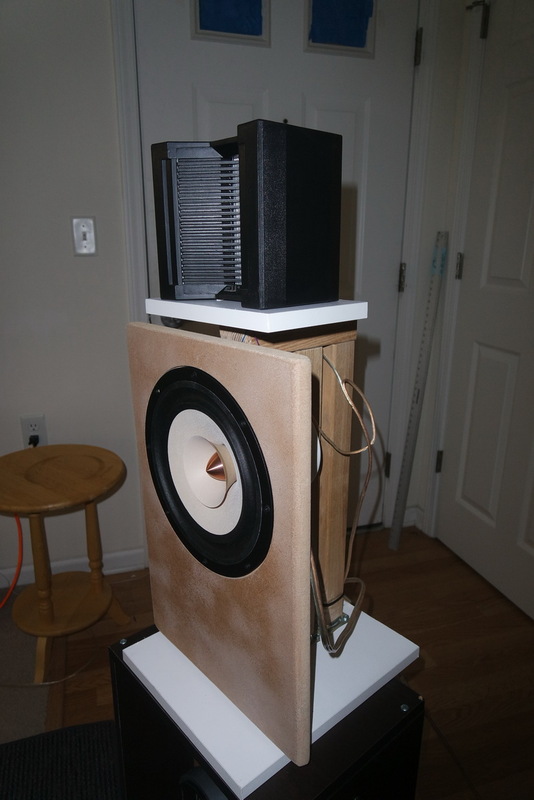 With this configuration there is very little energy in the mid-bass baffle. 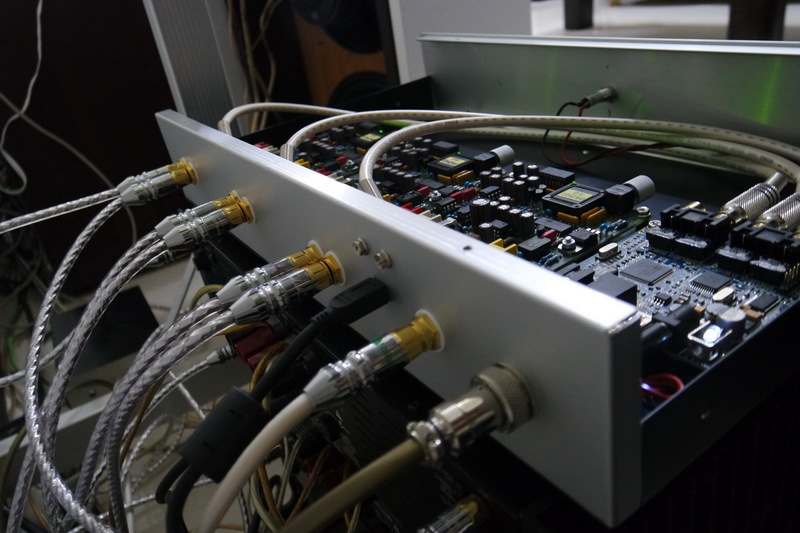 For the crossover I'm using a miniDSP 2x4 in 1x4 mode on each channel. Crossover frequencies are 60 Hz and 2200 Hz 4th order LR. 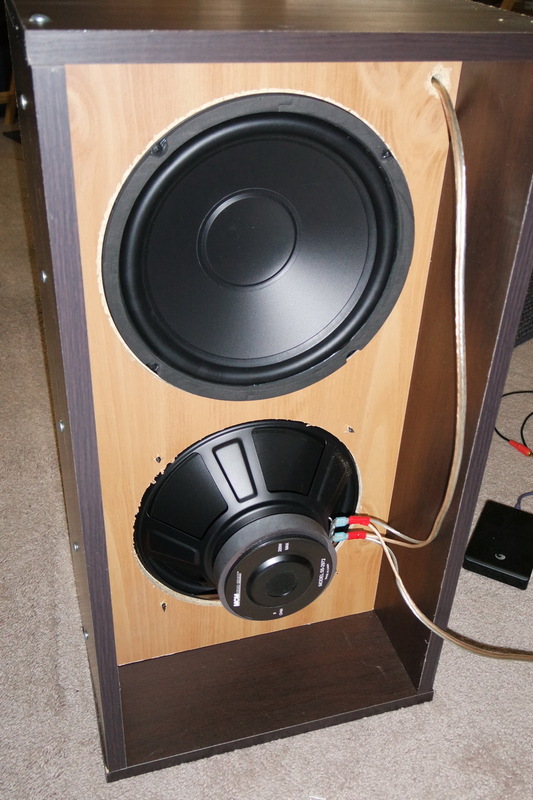 The woofer section is a simple H-frame using two very inexpensive woofers from MCM Electronics. These are just $9.49/ea when you buy four or more. For the money these are pretty good, relatively quiet and have low distortion. 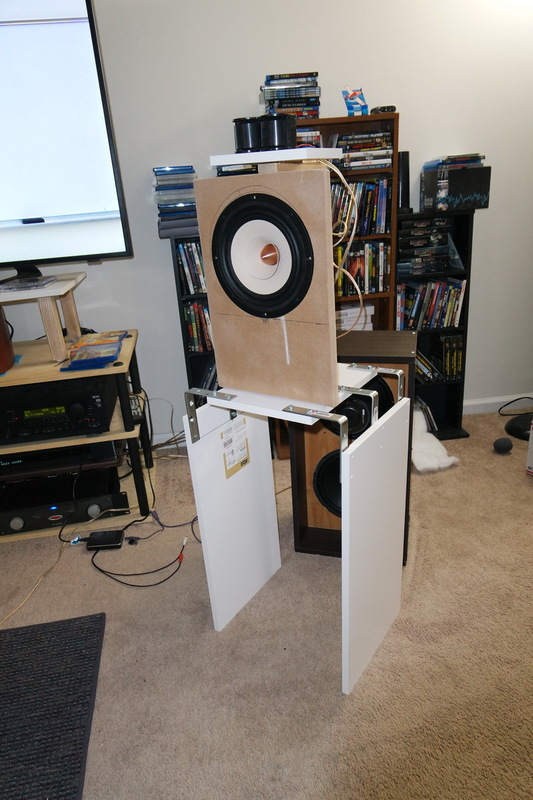 Cheap as they are, they still produce cleaner more natural bass than most high-end conventional box woofer systems. I'm convinced the Tang Band W8 1808 is a better 8"; driver than any of the SEAS or other high end drivers such as those in the Linkwitz Lab Orion. 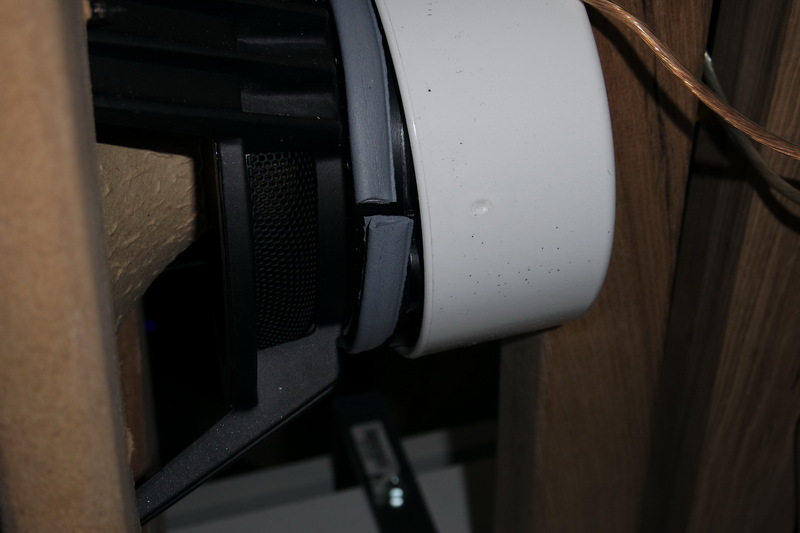 It's much better behaved at higher frequency and produces a much smoother upper midrange than such metal cone drivers. Distortion is extremely low with the 3rd being lower than the 2nd. I'm not a fan of single point source systems however and personally I would not use this driver for that application despite the fact this is clearly what it's designed for. The advantage of this driver is that it is easily capable of being crossed over at the necessary 2200 Hz which I would say is the bare minimum for the Lineaum. 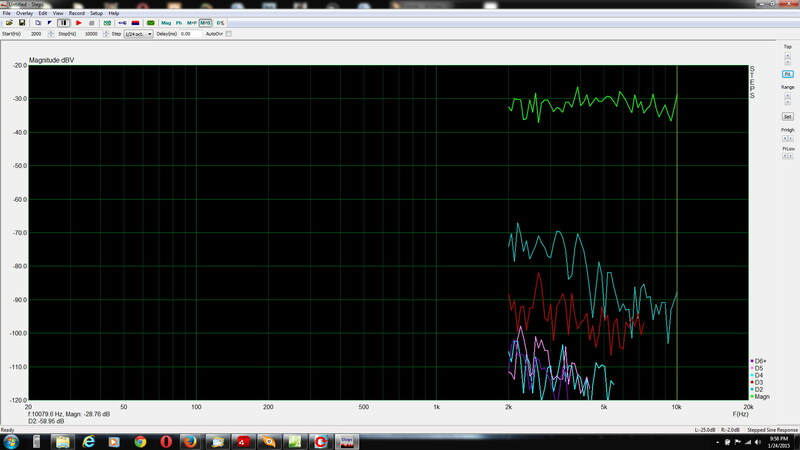 (I'm probably going to raise that to 2500 Hz) I would never use the SEAS or similar 8" drivers to such a high frequency. Listening to these in my small company apartment is a bit frustrating. I'm afraid to turn it up much for fear of annoying the neighbors but on occasion I simply cannot resist. 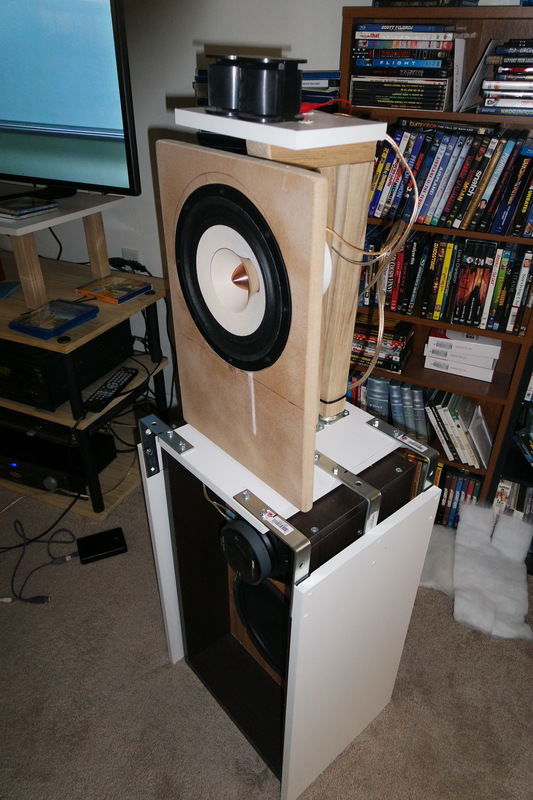 These are the overall smoothest most refined sounding speakers I've ever assembled. Despite not being in an ideal room set up the sound stage is extraordinary with amazing depth and height. As for what are the contributing factors to the performance I can only assume it is a combination of superior driver quality and elimination of any baffle resonance. I look forward to the day I can set these up in a proper listening room where I can crank them up a bit and really enjoy them. Lineaum (the output of the Lineaum drops off rapidly starting a little below 2 KHz so I started the measurement at 2K. This was a 4 volt rms input.